The Point at City Center community is sold out and is not in active development by builder. If you are interested in The Point at City Center or similar new home communities, contact us today! Our agents are very familiar with new and newer construction in Newport News, and can identify resale opportunities in The Point at City Center, as well as builder inventory available in nearby or similar communities in Newport News. To view 10 more pictures, interactive maps and the full, detailed description of the The Point at City Center community, please Login. Get that new construction condo today in The Point at City Center. The builder designed this development to bring all the elements of urban living together into one masterpiece. Be a part of the green movement by using those legs instead of a car to get to any number of places. 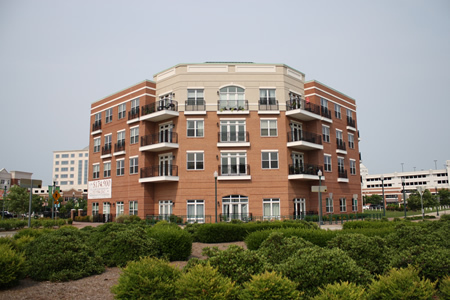 As far as locations go, they don’t come much better than this one- City Center at Oyster Point in Newport News, VA. Upscale shops are steps away and so are eateries. Military bases like Joint Base Langley-Eustis and Camp Peary are not a bad commute either. This new construction community appeals to homebuyers with high expectations but firm budget boundaries. The builder carefully planned this complex to accommodate different types of housing options. The Point at City Center offers many types of floor plan options, which include those for a loft, one-bedroom plus study, two-bedroom and three-bedroom units. Size ranges from around 1,000 to more than 2,300 square feet per condo. The builder made sure homeowners will not only enjoy living here but they will feel safe and secure as well. The Point at City Center features infrared and key-code security 24 hours a day, seven days a week with keyless entry for residents. Garage and courtyard parking is secured as is the storage center and mailboxes. If the power goes out, the building has a generator to decrease worries. Amenities at this new construction complex include a lakeside grilling patio, lakefront pool, cabana, multiple trash chutes, interior elevators and more. Living in this area of Newport News is cause for celebration. This might be a dot on the Virginia map but this dot represents fun and freedom. Go shopping for new fashions at Coldwater Creek, J. Jill, Talbot’s and Banana Republic. Eat at Taste Unlimited or Salsa’s Mexican Restaurant. Come to Fridays at the Fountain to hear local musicians perform and Family Films by the Fountain to see good movies for all ages. Not many new construction developments can compete with this place. The builder knew he was creating a way of life and not just a place to live in Hampton Roads. The Point at City Center shows how condo living doesn’t just cause small changes for the better, it makes a world of difference. Send me more information about communities similar to The Point at City Center. Our agents gladly offer FREE property tours of The Point at City Center, Newport News and homebuyer consultations to all serious buyers.